WHAT IS TACTICAL STRIKE GROUP 4? Our clan commander is an Army veteran (HHC/118, 11A, grade O-4 (Maj)), and we place special attention towards encouraging any US Active Duty military, Guard, Reserves, Veterans and Retirees to join with us, and to welcoming them to our team! Many of our members are military veterans, and quite a few of them are still Active Duty.... so any current or previous military personnel are always welcome! To view a list of our current military members, visit the "Hall of Heroes" on our OpServ (the URL address is located below)! 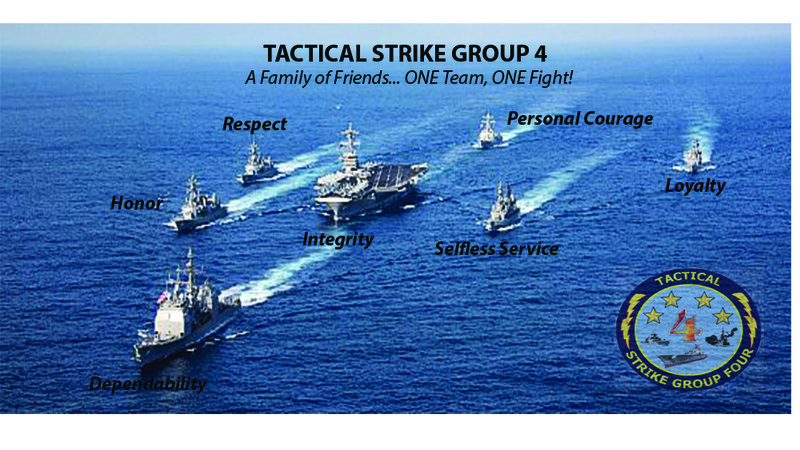 Tactical Strike Group 4 is serious and committed to its Core Value of building a close-knit “Family of Friends”. To that end, we only recruit, accept and retain members who reflect that policy. What this means is that as a clan, we do not “chase numbers” or recruit and accept members just to have a large roster! We would much rather have a smaller amount of solid, dedicated and reliable members by quickly getting rid of the "deadweight" players who are unwilling to develop lasting friendships, than have a huge roster of members who are merely “paper soldiers” and “names on a list’! Tactical Strike Group 4 is also the place to be if you are tired of solo queuing and are wanting to expand your Warships experience by battling alongside friends! If you have previously been in other clans that are riddled with divisive in-fighting and are wanting to escape the nasty “clan politics”…. Or if you are genuinely seeking to improve your gameplay and personal stats…. then welcome to the Strike Group! "Team" players - if you'd rather play alone, we are not for you. Consistently ACTIVE players - no deadweight, no "paper soldiers", no "I'll play for a week or two then disappear 'ghosts'", etc. (**note: we regularly cut deadweight out of our roster) - Do you want to have fun and div-up with other players? Well, guess what.... You're not the ONLY one! So, do your part... be active, be reliable and "be there" for them too! Don't be a selfish gamer. Players willing to help and to teach - We were ALL tier I and II at one time. Don't be arrogant and snooty. Help the newer players and share the experiences you've had with the game. Have the understanding that communication is critical to building a cohesive team and to completing missions in a successful manner (Refer to #4 and #7 below) . Be on the North America (NA) server and Be ACTIVE with the clan! All members must be active during the week. Pop on, say hello, Blow up some ships and just let the other members hear your voice and see you participating (simple)! In order for a clan to grow and improve it must be active and not merely carrying a roster of "paper soldiers" and "deadweight" members! Participate in an initial meeting on Discord with one of our officers and/or a Clan Recruiter BEFORE your application is approved or a membership offer is extended to you. Be 18 years of age or older in age and attitude.... Mature, Low-Drama members required! Represent yourself and your clan well! TSG4 does not subscribe to the notions of "elitism" or "arrogance" based of performance ratings. All of our in-game clans are part of the same organization outside of WOWS and are treated functionally identical, not as tiered clans based on WR, WTR, etc. TSG4 operates as a "Battalion" and each in-game clan is a "Company" within the battalion. TSG4 members of all skill levels are assigned evenly into each company. Racism, Sexism, Bigotry and Bullying is not allowed… and will NOT be tolerated! Understand that Religion and Politics are not games, so please do not discuss them on DIscord or the forums. We feel that friendly competition is healthy, but please curtail your "game rage" when things don't go as planned! Our objective is simple: build a strong “Family Of Friends” that are willing (and capable) of practicing the mantra of "One Team, One Fight!" and that our members can rely on for teamwork, camaraderie, and trust in battle! You don’t have to be “the best”, but you must be able to accept observational constructive criticism and be willing to learn! You must also have the proper attitude and positive personality. SALTY and NEGATIVE behavior/comments are not conducive to a supportive environment!! In-house Promotions, Awards and decorations to showcase and acknowledge your personal achievements in TSG4 and in the game! In-house Tournaments and Competitions for gold... and other prizes! Personal Leadership development and advancement through our Chief Petty Officer course that can also be applied outside of the game (real life learning). an organization of Top-notch, Quality People who have been screened and vetted through our Recruiting Process! We offer a "learning environment" for players of ALL skill levels through online self-taught training modules on our OpServ as well as numerous "hands-on" in-game FTX's (Focused Training Exercises) that are hosted and led by more knowledgeable and adept members in the particular topic of training. Additionally, the majjority of our members are willing to work with newer/lower tiered members in any tier ship in which they are trying to improve! We value open and timely communication, as well as the ability to remain silent in order to listen to instruction and follow direction/guidance. We offer several ways to maintain contact with members of the guild via our own Discord server, our Clan's OpServ and even a Facebook page for the clan! We also offer a very organized Military hierarchy structure that includes a clear timeline and criteria for Promotion that is "based on" the actual US military (but scaled-back a little for gaming purposes) and an expansive Awards and Recognition system (with clearly defined criteria for each award). Each of these systems are designed as pathways for not only individual improvement and progression, but also as a means to grow and improve with the clan! Using these methods of Training, Promotion and Awards, members can watch themselves grow and rise through the ranks within the clan without the typical "politics" and "favorite's Game" that is prevalent in most other clans. Above all else, we offer a fun environment that is based on the concepts of "Family" and "Friendship" where "bad attitudes", "game raging", "stat trolling" and "performance pressure" have no place! All that we ask in return is that you comply with the above requirements, carry within yourself a strong desire to work closely with your friends and clan-mates, and be a personal representative of TSG4... at all times! [TSG4} Tactical Strike Group 4 encourages all of its members to have fun and engage themselves in an atmosphere of Friendship. We accept all players, as long as they meet the requirements as set forth above. Come show what you're made of... and earn your stripes! 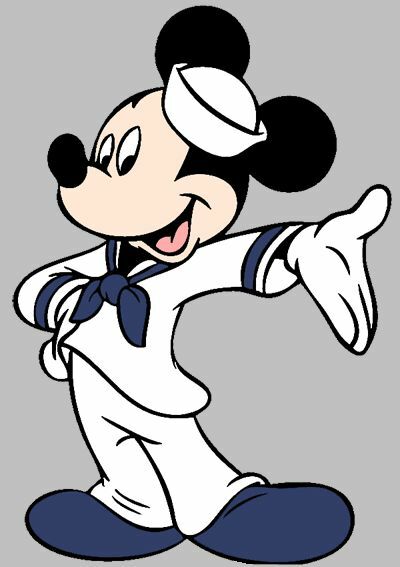 Mickey joined the sea-faring pollywogs.... you can, too! To get the ball rolling with joining TSG4... Visit our clan website, register an account using your in-game name and submit an official application through the "Join Us! (Application)" button on the top bar. Join our Discord server and speak to someone on our Command Staff or one of our Clan Recruiters (see membership requirement #3 above). **Important: Do NOT click "apply to clan" in the game. Our Discord server address is: https://discord.gg/sTck9hr. For “general” clan information, look us up on the WOWS clan page by typing TSG4 into the search box, send a message to any clan member in-game or visit our OpServ!